Originally from the Black Country (the glottal rich manor of Walsall to be exact...), John Twells is now based up north in Manchester - from where he runs his Type imprint and casts out dark, yet never suffocating, compositions under the Xela pseudonym. Having recorded silicon-rinsed soundtracks alongside Gabriel Morley as Yasume, Twells is best known for his work released under the Xela appellation. Showing an astonishing evolution in sound from early releases such as 'For Frosty Mornings & Summer Nights' and 'Tangled Wool', through to the ink-blot atmospherics of 'The Dead Sea', what originated in the clinical environs of Digitalis was gradually eroded by thickly hued instrumentation and sublime arrangements - with Twells incorporating a vast palate of sounds and influences that retains sharp and piquant flavour despite the rich ingredients. 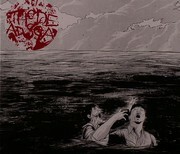 Featuring a fantastically macabre set of illustrated cover art from Matthew Woodson (www.ghostco.org), 'The Dead Sea' is Xela's ode to all things maritime - with the album's thematic thread detailing a doomed ocean voyage that meets an abrupt end amongst a swarm of malignant zombies. Drawing on the work of 1970's horror directors (Dario Argento, Lucio Fulci and George Romero et al.) and their respective soundtracks, 'The Dead Sea' pays a considerable debt to the likes of Goblin or Fabio Frizzi - albeit frayed with a bloodied disposition that reveals a love of Earth, Circle and Wolf Eyes. Nowhere near as oppressive as this description could have you believe, Xela also exposes a deep seam of kaleidoscopic folk amongst his collection, with generous nods going to the freewheeling antics of labels such as Fonal and The Jewelled Antler Collective. Opening through the lace-curtained drone of 'The Gate', Xela manages to be both wilfully obtuse yet unremittingly focussed - as a cold-water batch of foggy soundscapes briefly parts to reveal some insistent percussion. Next up are the heat-haze melodies of 'Linseed' and its tender coalition of acoustic shards and mealy rhythms, before a Victorian music box is exposed to some virulently thrumming necromancy for the startling 'Drunk On Salt Water'. From here Xela continues to coax both light and dark from a palate of instruments he's accrued whilst travelling the globe, ranging in style from the throbbing Theramin-heavy electronics of 'Creeping Flesh' and the tarnished grandeur of 'Savage Ritual', through to the seething distortion of 'Humid At Dusk' and nervous shimmer of 'Briefly Seen'. Horrifically good! 03. "Drunk On Salt Water"
10. "Watching A Light In The Distance"